I told him who we were and that I was interested in visiting the school to learn about its educational system. He immediately took us to the principal’s office. After speaking with the principal for a few ministers, we learned that the Carlos Darwin School is a K-7 school with 75 students. The school has seven educators including the principal. The principal or what he termed himself to be—the “institutional leader”—has other functions in the school. In addition to overseeing the school’s overall operation, the institutional leader teaches sixth grade. Class size is very small, ranging from seven to 10 students. The building however has room for many more. At no point during our conversation did the institutional leader speak to us about school closure despite the fact that the condition of the school is very poor. Interestingly, all of the schools had outdoor, roofed and physical education facilities. 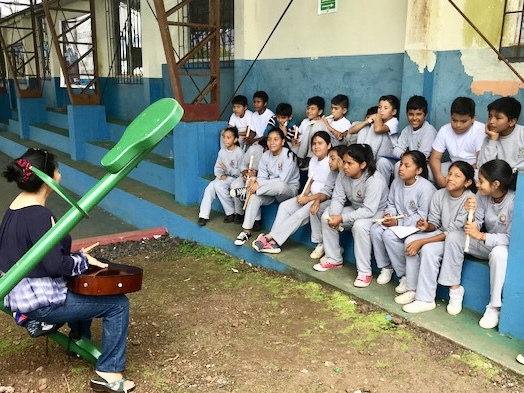 This entry was posted in Education and tagged AASA, AASA International Seminar, Galápagos Islands, Gladys Cruz, The School Superintendents Association by Dan Domenech. Bookmark the permalink.